M.J. Logan is an avid reader and writer of speculative fiction, with Christian fantasy being her favorite genre. She strongly believes that those of us who wish to use our gifts from God to change the world are “RIGHTERS”. With three Amazon Best Sellers under her belt from her debut fantasy books-- The Maurpikios Fiddler series, she now introduces the world to her new Trilogy- The Righting Wars with Book 1-- The Initiation as the first release. It is her hope that through her writing she will continue to promote unity and hope throughout the world for those with a love for fantasy fiction and all genres. She resides in the Southeastern United States with her husband and two sons, and her favorite charity is St. Jude’s Children’s Research Hospital in Memphis, Tennessee. I loved The Initiation by M.J. Logan. It is the first book in a series called The Righting Wars and I can’t wait to read the rest of the series. I want to know how it ends. I want to know if they make things “right”. It would be great if they can make things better, put America back on the right course. What are they trying to make right? That is probably the question you are asking yourself now. I will tell you. Imagine a fictional presidential election. Let’s say 2016. Imagine that the winner is divisive and makes a lot of promises, some good and some bad. Let’s say this president also has a deal with Russia and other enemies of America. This deal results in a nuclear war called 'the annihilation' in the history books. The America that comes out at the end of this war is a dictatorship where people are separated according to the color of their skin. This is what needs to be made right. This is what needs to be corrected. And there is a special group of children being born who can do this. I wish I had written this novel. I feel exactly like M.J. Logan does. I just don’t think I could have done as great a job at telling this story. The characters are awesome, especially “Rowe”. We watch her grow from a little girl with amazing gifts into a strong, confident young woman with amazing gifts. I loved every step of the journey. She is blessed with a strong, loving family. Alfred, Maya, and others around her give her the love and skills she will need to survive. The plot is tight, cohesive, and partly ripped from today’s headlines. The setting is an imaginary and dark America, but it is an America that still has love, and still has hope. This may be one of the most important books written since 2016. The Righting Wars: The Initiation is a work of modern Christian science fiction by author MJ Logan. We begin with a dystopian world on the plains of what used to be the United States of America, one thousand years after the last major world war. Now, the Jenroe rule with an iron fist, their political ideals preventing any crossover between the wealthy elite and the crippled poor. Everything changes when the Righter, Rowe, is born. She is a girl with unique gifts that give her the ability to rewrite the past and alter the future. Rowe is raised amid the cruelty of the Jenroe system, and when that cruelty is directed specifically at her family, it sparks a chain of events that will change everything from bygone times to the here and now. I really enjoyed the concept of The Righting Wars: The Initiation and although this is clearly only the beginning of Rowe’s epic story, the initial plot is full of explosive action that keeps you turning pages right to the end. Rowe’s character development is given the full spotlight and I found her to be a likeable, powerful and plucky heroine who was appropriately angry about her situation. The only flaw I found was that the Jenroe Administration seemed to just be cruel for the sake of it, and I’d hope it’s something that will be explored more deeply in future stories. That said, I’d definitely recommend MJ Logan as an enthralling author who delivers on action and excitement. 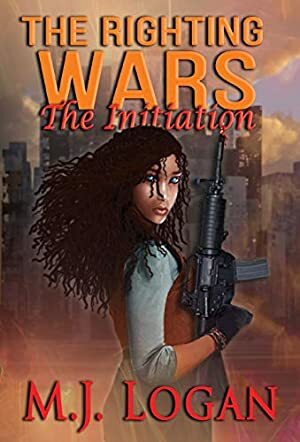 The Righting Wars: The Initiation by MJ Logan is a science fiction story with strong hints of fantasy and elements of dystopia. The setting is a thousand years after the Third World War and after the US has morphed into a society where a tiny few live in great wealth while the majority wallow in misery, and the injustices orchestrated against the poor under the Jenroe regime are appalling. It is against this backdrop that Piper Sparrow, aka Rowe, is born. But she is taken away from her mother and handed over to a new mother, Maya Pense. The Medical Mission and the people around her don’t understand that Rowe is born with the mark of the “righter,” and her hatred for the injustices of the regime grows stronger with each passing day, escalating with the termination of communication with her biological sister. Now she can’t take it any longer. It’s time to rewrite history, and she is about to change events the way she wants. I enjoyed MJ Logan’s imagination and the strong sense of conflict demonstrated throughout the narrative. Although this is a novel set against the backdrop of a distant future, it is very revelatory of the ills of contemporary capitalism and the dangers it poses to society. The author has built a strong plot on a reality that readers can relate to, and has created characters that are as compelling as they are real. The relationship between the protagonist and her non biological mother is enigmatic and it is interesting to see how it develops. I enjoyed the fact that the protagonist’s gifts become evident as she develops in her personality. There are very interesting and humorous scenes in the story. For instance, when Rowe tells Maya that she’s changed their story, it is interesting to see Maya’s astonishment. She doesn’t know that this gifted girl has been behind the promotion of her husband to a brigadier general. She has rewritten his story. The Righting Wars: The Initiation is beautifully narrated and the emotional intensity of the story makes for an engaging read.